All stamping was done with Onyx Black Memento ink onto Neenah Solar White cardstock and die cut out with Quickutz dies. I used the following Copic Sketch markers to colour the kitty: E0000, 41, 43, 44, Y11, 13, 17, G21, 85, B32, 34, 37 and the Colourless Blender. I also stamped the hat portion onto a piece of scrap and fussy cut out just the flower and the bow then coloured and adhered to the main image with a dab of clear Create and Craft silicone dimensional glue. Pumice Stone Distress Ink was applied with a foam ink applicator tool to all the panels edges and I used the metal die on the kitty panel as a stencil to preserve the white border. All the decorative paper is My Mind's Eye (I finally made myself use some of this huge stash of gorgeous paper) and sheer white ribbon is from Michaels. 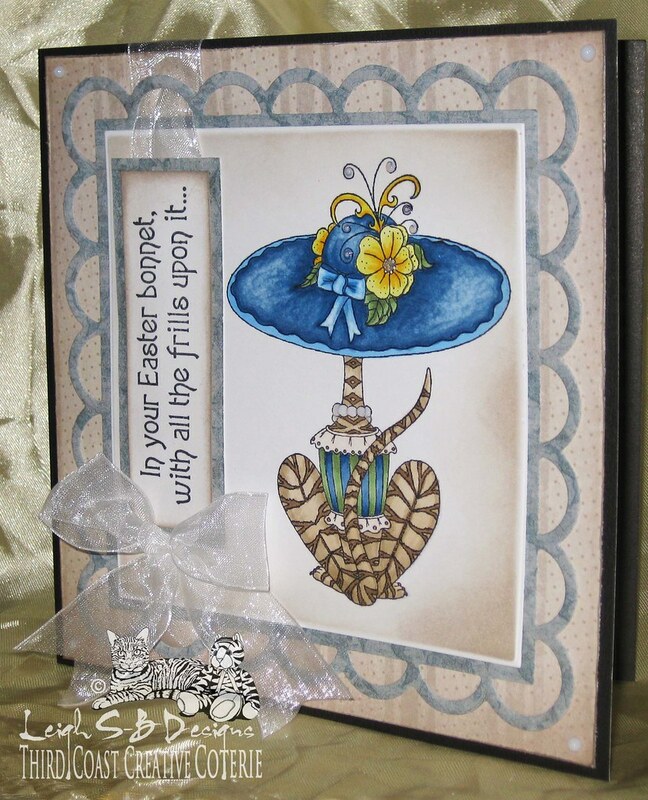 I completed my card by adding White Magic Transparent Viva Pen pearls to all 4 corners of the card, kitty's pearls and also to the flourishes on the hat plus a dash of diamond Stickles glitter glue to the center of the flower. I'd also like to remind everyone that my first DominoART challenge is underway! Please visit my DominoART blog to join in my altered game art challenges! D'ART#1 is Domino Books sponsored by Rick St Dennis Digital Stamps. The domino book kit was only a freebie for 2 days last week but now it's on sale in Rick's Etsy store! Hope to see you all over at DominoART and Third Coast Creative Challenges too! Hi Leigh, it's great to have you join us on the Use Your Stuff blog for the first time. 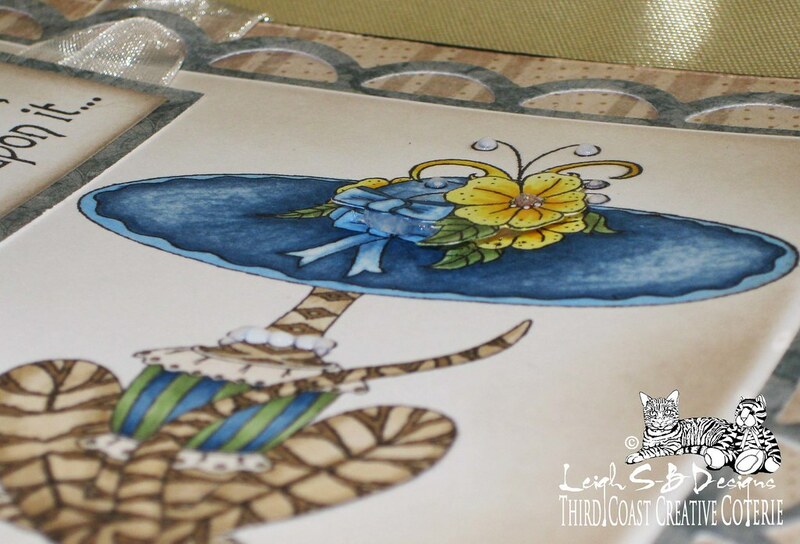 Your card is beautiful, I really like the way you coloured the cat and the scalloped frame you added. Such a fun card!Love the image! Thank you for sharing it with us at Card Mania Challenge and Good Luck! 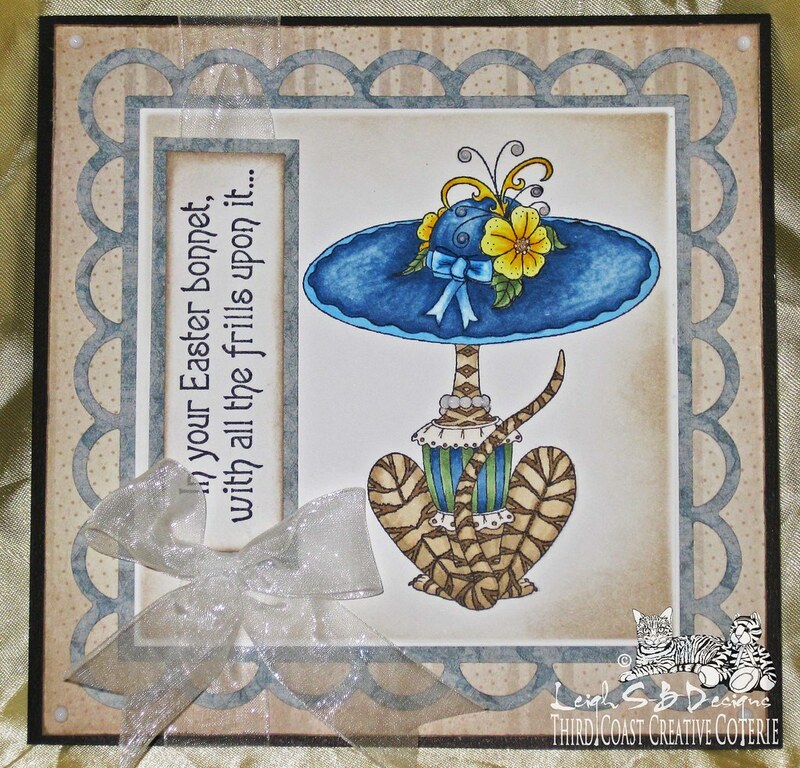 Adorable image and love the sentiment and now I am singing snippets from the Easter bonnet song. Lovely card. Glad you were able to join us at Simon Says Stamp and Show! Thanks for joining us at TIOT!